Barefoot Pool Service your #1 Choice for pool cleaning in Corolla with over 12 years in the industry and familiar with all aspects of Pools and Spas. Customer Satisfaction is our first priority. People from up and down the east coast flock to Corolla North Carolina in the summertime to get away from their normal lives and experience our piece of paradise. Boasting pristine beaches and small town atmosphere this quiet little beach town comes alive and folks flock to the beach to escape the summertime heat. 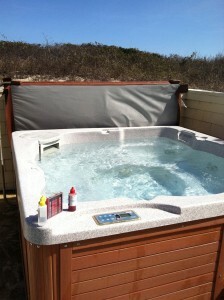 Having a Pool and Spa on the Outer Banks is a must if you would like to see your beach house rent really well. Most Families that come to the Outer Banks have small children and the beach is not a place to be with a small child, especially when it gets HOT! It is a lot easier to walk out of their rental house and have a backyard Oasis to Play in. That is when choosing your Corolla Pool Cleaning Company is very important. We get to interact one on one with your guests and represent your house the way it should be. Meeting your guests gives a chance to talk with them and provide them with important information about your house or where they should go eat. 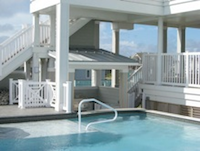 This also gives us a chance to inspect to make sure your beach house is not getting damaged. Repeat Business in any business is the only way to go. We are here to make sure that we meet you and your guests expectations. Some people require that extra special touch, and that is what we specialize in. Keeping your pool area clean and clutter free so that it is safe and inviting for them to enjoy.